New restaurants now keep showing up in all corners of Pune with predictable regularity - a sign of the rapid growth underway in this lovely city. It was only a week or two ago that we noticed Trois Kitchen & Wine Bar which recently opened its door in my neighbourhood. The restaurant is housed in a glass-fronted bungalow that provides both indoor as well as open-air terrace seating for a romantic dining experience. Well, truly romantic only if you can ignore the incessant honking of Indian traffic on busy Central Avenue in Kalyani Nagar! The iffy reviews on Zomato had me worried, but given how near it is from home, I decided to stroll in during lunch today. And it was a good thing I did too! Trois (pronunciation: tr-wah in French) stands for the number three; have to figure out the significance of this naming. Their food: European with a focus on wine-pairing. We took a seat in the outdoor terrace area. Given the monsoon season, they had put up a canopy overhead; the natural one of the green leafy trees would be far prettier once the rains stop. We noticed a very diverse bunch of people, including several foreigners, enjoying a leisurely weekend lunch. Kalyani Nagar's expat population will, hopefully, allow this and some other restaurants with a focus on Western/global cuisine to thrive. They had some weekend specials and we decided to order off that menu. They put up a small bread basket for us - the breads were warm and varied. Importantly, they passed the initial taste test! We polished it off and sampled a second helping! 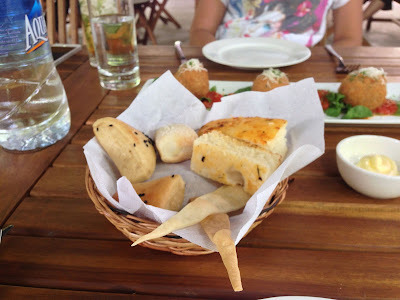 Both starter and mains were pretty good. 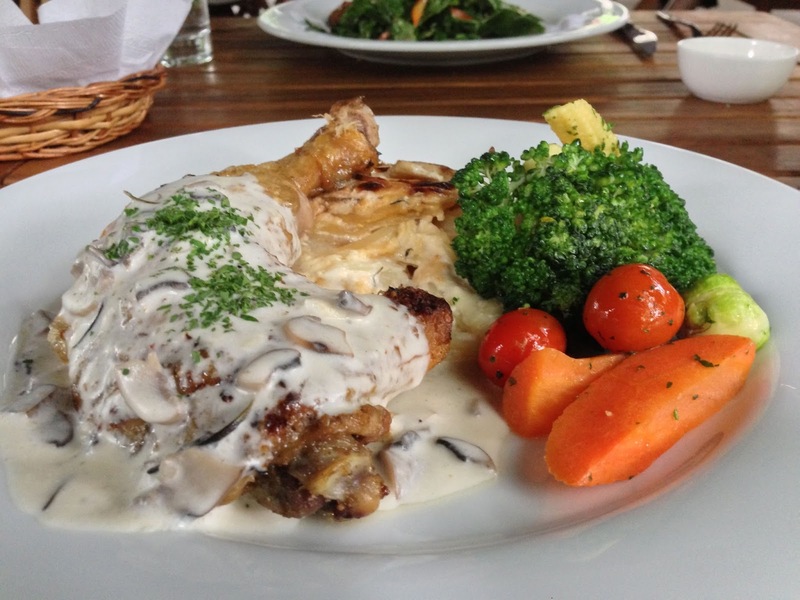 We had stayed with chicken dishes today: mine was a whole leg of marinated leg of chicken in a white mushroom sauce with steamed veggies on the side, while my wife had selected a pan-fried breast in a spicier tomato-cheese sauce with mashed potatoes and salad. Both dishes were flavourful and crafted fairly well. 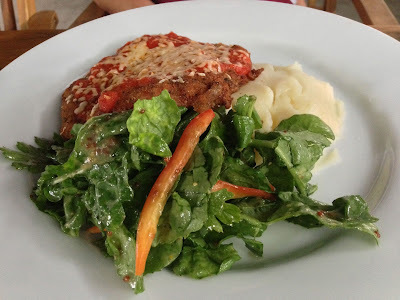 The arugula leaves were fresh and of good quality too, a rarity in non-five star restaurants in the town. We also shared a portion of a Custard Apple Creme Brûlée, something they plan to add soon to their regular menu. 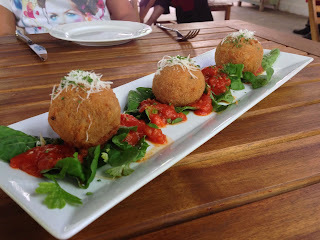 We loved the dish! While the custard apple doesn't help with the texture of this dessert, the taste was pretty good. Overall, a good place for a relaxed dinner and wine. I bet the place seems even nicer when the rains end and you only have a leafy canopy and the sky above. 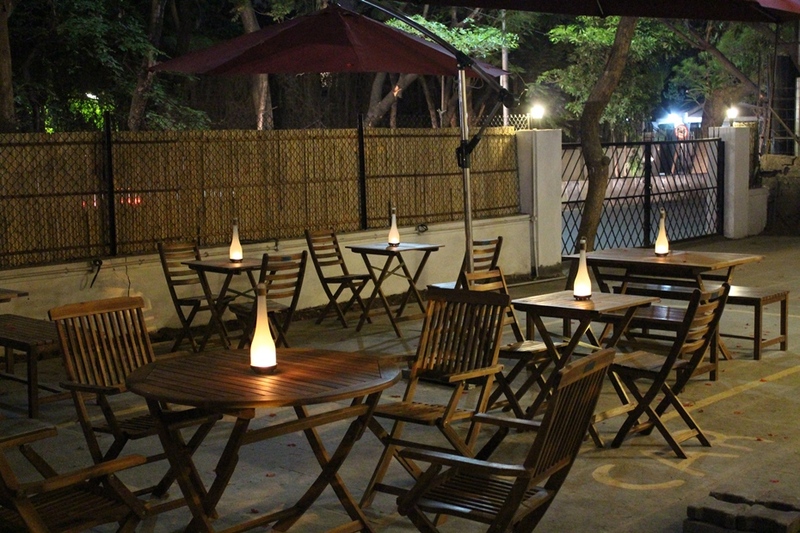 Trois Kitchen & Wine Bar is located right opposite Pizza Hut (and the lane where Big Bazaar is located) in Kalyani Nagar. Great review and writing. I am a regular follower of your blog. From what I have heard/read, they have named it Trois, since there are three partners that have started this restaurant. Would like to invite you for a tasting in Pune. How can I get in touch with you? @anon: Thanks! Did get an update from the restaurant on my twitter feed. Three courses and three people coming together. @saudamini: you can email me at shantanughosh AT Hotmail.